Chicken and egg congee. My kind of oriental breakfast. In a heavy bottomed pot, sauté your sliced ginger and chopped carrots, celery and onion in your oil on a low to medium heat until softened (about 5-8 minutes). Add your star anise and stock and bring to the boil. Turn down the heat and add your chicken pieces. Poach on a low simmer for 40 minutes and then use a slotted spoon to remove the chicken and the star anise. Bring the stock back up to the boil and add your rice. Cook on a boil for 15 minutes and then turn down to a simmer and cook for a further 1 to 1½ hours, stirring regularly to ensure the rice doesn’t stick to the bottom of your pan – this is really dependent on your taste. The longer you cook the congee, the thicker it’ll become. While the congee is cooking, prepare your chicken by discarding the skin and bones, and either using your fingers or two forks, shred the chicken meat. 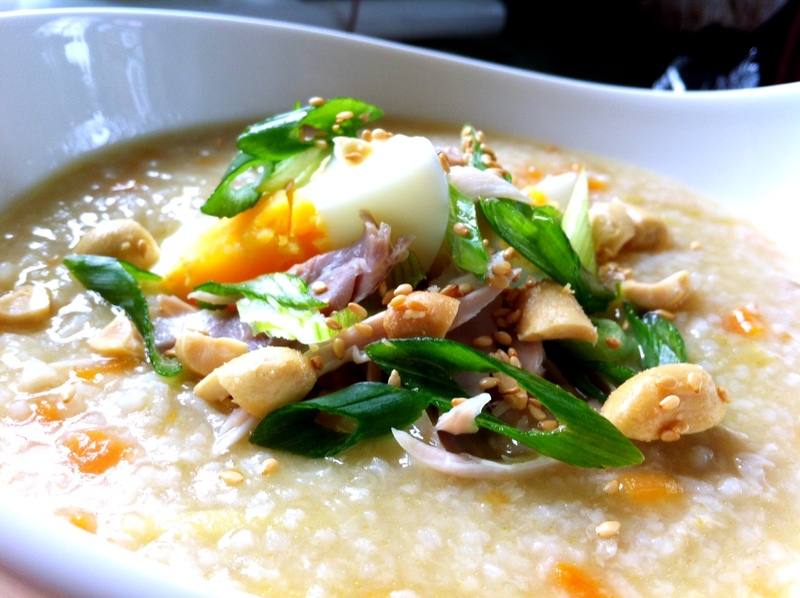 When you’re happy with the congee’s consistency, ladle some into a bowl and top it with your shredded chicken, boiled egg, spring onion and other garnishes eg peanuts/coriander etc – whatever you like. Finish it with a tiny drizzle of sesame oil or a sprinkle of sesame seeds.